Recently, while wrapping up a day of work on the parking deck at Riverview Medical Center in Red Bank, New Jersey, Brother Frederick Frato, a member of Glaziers Local Union 1009 (Springfield, New Jersey), encountered a distraught man exiting the elevator. Brother Frato spoke to the gentleman, checking to see if he was okay, but his efforts to engage him in conversation were ignored. Brother Frato continued to work, but looked over to see the man suddenly began to climb over a short wall in an apparent attempt to jump off of the parking deck. Fred sprang into action. He immediately ran over, grabbed the man, wrapped his arms around him, and slowly guided him away from the edge and towards the center of the parking deck, while assuring him that everything would be okay. A police officer, security guard, and fellow members who were working with Fred, responded to his pleas for assistance. 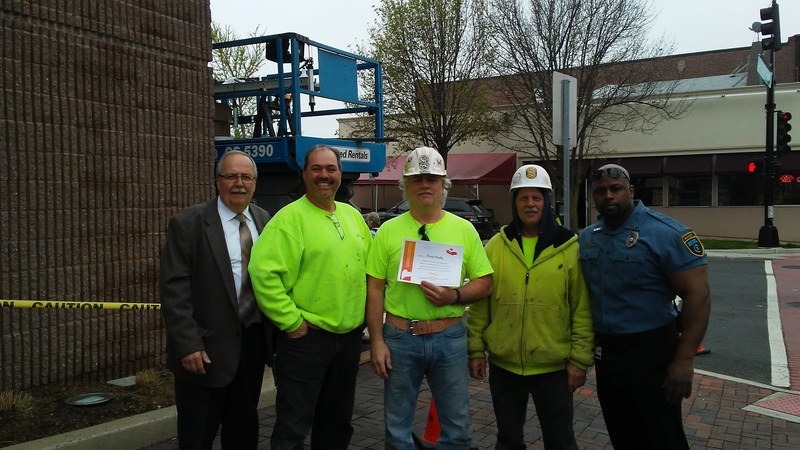 L to R: Mike Jahoda, Manager Engineering/Maintenance, Riverview Medical Center; Steven Frato (LU 1009); Frederick Frato, (LU 1009); Paul Hartmann, (LU 1009); Lavon Connally, Sr., Security Officer. Brother Frato’s brave actions and quick response were recognized by Riverview, and he was presented with, ironically, a “Good Catch” award. 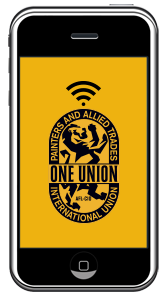 Good Catch awards are given to individuals across many Hackensack Meridian Hospitals for “catching something before it becomes a safety event, or causes emotional or physical harm.” The IUPAT commends Brother Fred Frato for his heroic efforts that day. Well done!